Perfect PDF 5 Editor ($73, free demo with watermarks) is most definitely one of the better PDF editors I've tried. Not only is it full-featured and considerably cheaper than Acrobat, it uses an attractive and logically arranged Office 2007-style interface which puts functions where you need them, when you need them. 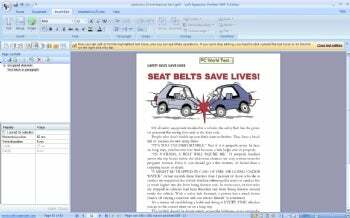 Perfect PDF Editor's Office 2007-style interface makes it intuitive to use. Said functions include just about everything you need to spice up an existing PDF document, or create a new one from scratch. Design elements include text, images, shapes, and even form fields. About the only thing I found missing was the ability to place a signature field with date, time and other info. You may place a signature, but it's the graphic only. One exceedingly minor complaint: I always find it slightly annoying when a program launches Internet Explorer specifically as Perfect PDF 5 Editor did post-install, rather than the default browser (in my case, usually Firefox). If you need the ActiveX support lacking in Firefox, fine, but it wasn't required in this case. The Perfect PDF 5 Editor demo watermarks everything it displays and saves with a rather large, albeit attractive, logo. To get rid of it, you must of course buy the program. To that end, if you're looking for a cheaper alternative to Adobe Acrobat, this demo is definitely worth downloading. Note: Perfect PDF 5 Editor is sold for 50 Euros. The price given here is based on the exchange rate when this review was posted.